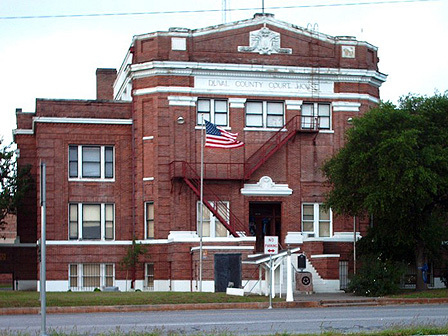 Since 1916, the Duval County Courthouse has served as the seat of government for thecounty. The courthouse was designed by Sanguinet, Staats, & Gottlieb , a successful and influential architecture firm in Texas. The Duval County Courthouse is falling apart despite its use for a majority of the county’s government functions. The building is threatened with structural damage, substantial water infiltration, and malfunctioning plumbing, mechanical a nd electrical systems. Electrical wiring was attached haphazardly to the exterior of the building and there vegetation growing in the mechanical systems. The courthouse is overcrowded with county officials, staff, and prison function, which has resulted in the use of electrical equipme nt rooms being used by staff. Recently, Duval County lost millions in appraisal values and is without the financial resources to address the courthouse’s many problems. The County seeks recognition of the building’s endangerment to help them garner support and financial assistance to reverse the decay and damage that are unmistakably present.